Sanford, the company that makes Sharpie Markers, says that Sharpie ink is “non-toxic”. That may be true, but there are things in the ink that are definitely not good for you. 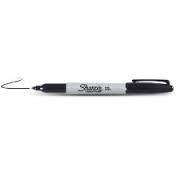 Questions of black lips and tongue aside, Sharpies contain alcohols and ethylene glycol monobutyl ether. That can’t be good for the skin.